A significant cost to the grower in irrigation farming is the cost of the water itself. In addition, in many drainage basins, the water is completely used by the time it reaches the endpoint. A good example of this is the Colorado River drainage basin which starts in the Rockies and ends in the Imperial Valley with water drawn off for various uses along its entire length. In the ideal situation, the water is used efficiently and economically. This means that the water directed onto the irrigation farm and down the furrows is made available to the crops and does not simply flow across the top of the field and off of the farm as runoff without actually entering into the soil and penetrating to the roots of the crop. For this reason, growers often will add an infiltration aid to promote movement of the irrigation water into the soil. The infiltration aid cannot induce erosion or have a long-term potential for negative health or environmental effects. It also has to be cost effective. 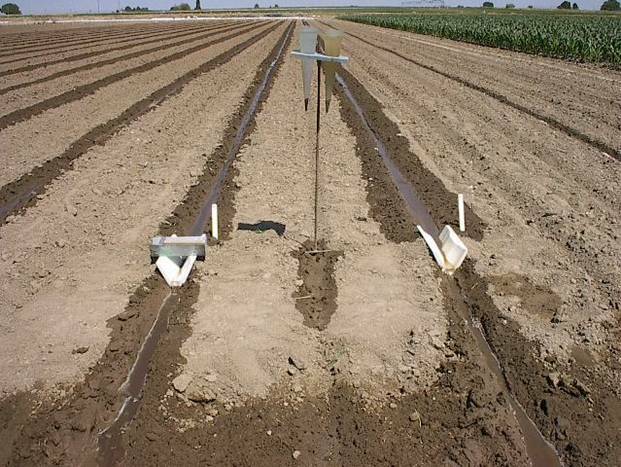 Two furrows at an agricultural field station in Idaho are shown in this image. The furrows were being treated with irrigation water drawn from the Snake River into a network of canals that ultimately are subdivided onto individual farms. The furrow on the left was being treated with irrigation water plus SoilSentry™, the furrow on the right was receiving irrigation water with no chemical treatment. The apparatus placed in the furrow allowed measurement of amount of flow as well as amount of eroded soil that was suspended in the flow. In the treated furrow, the amount of flow at that point was significantly less than the amount flowing down the furrow on the right. Because each furrow was receiving the same volume of input at the top of the field, the decreased flow down the field in the first furrow was known to be due to infiltration of the water into the soil rather than simply flowing across the top of the field too much as was observed in the second furrow. It was also easy to see that erosion was a lot less, almost to the point of no erosion, in the furrow on the left. That can be seen by sampling the flow from each furrow and pouring it into a settling cone. Most of the eroded soil settles to the bottom of the cone. The amount of sediment can be observed and later weighed in samples from each furrow The the turbidity of the water from each furrow can also be measured, along with various other chemical assessments. The treatment with SoilSentry™ typically reduced erosion by 95% or more and improved infiltration by 20% or more. Because the soil particles are held on the field much better in the treated furrows, many of the chemical inputs that are associated with the soil particles, like fertilizer and herbicides and pesticides, likewise are held on the field. Otherwise, more of these chemicals flow off the field and become more broadly distributed into the environment. This image shows a device that was constructed of plexiglas so that it was possible to watch both the movement of water along the surface of a simulated furrow and the infiltration of the water into the soil. The device was loaded with about 8 kilograms of soil that was collected from different sites in the western states. Experiments like this help us to evaluate the performance of candidate molecules and formulas as soil-retention agents and infiltration aids in the lab. If the performance of a candidate molecule looks particularly promising in the lab, then we'll scale up its production enough to run some field-station tests like the ones shown above. If that works out well, we'll scale up more and work with commercial growers to run some early pre-commercial trials in real fields with real crops. The results of the field-station trials and pre-commercial field trials feed back on our lab assessments. If a candidate molecule performed well in the lab but not so well in the field, we can learn to modify the lab assays to make them more predictive. Usually this means that we make the lab assays tougher so that a positive test in the lab provides more confidence that a decision to ramp up the effort and expense to go to the next level might work out well. For example, our lab minifurrows and plexiglas infiltration apparatus are usually set at a slope of 10% whereas most irrigated fields have slopes of 2% or less. We found that a successful treatment (no erosion, good infiltration at representative rates of flow) under the conditions in the lab translated nicely to good performance in the field.